If you are contemplating building a small craft you will agree it is a big job choosing THE one! Assessment of individual designs is very difficult and especially so if not many boats have been built to a particular design. 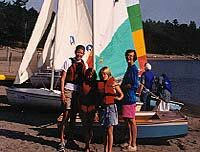 This page is intended to make assessment easier by offering thoughts and opinions from those who have been involved with either building or sailing the Firebug. It is important to remember that it is only a very small boat and therefore has limitations. Its not for offshore voyaging or performing heroics in. Dont plan to cruise the Pacific or go around the Horn! 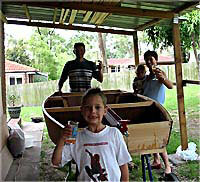 But as an introduction to boat building and as a small boat for learning in its hard to go past. 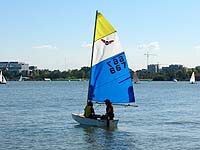 "We launched White Dwarf on the Parramatta River at Putney (Concord Ryde Sailing Club) on Saturday 17th September 2006 in beautiful weather. Both my son Jason and I were delighted with her responsiveness and I with her performance with near 90kg on board. A Firebug is after all less than eight feet long. "GDay Peter, Well I had an awesome trip. Thanks heaps for letting me come and check out all the Firebug stuff and setting the boat up on the lawn. Its not something Ill soon forget!" JP New Plymouth. It was a great day for all and we look forward to next sailing year, when once again, the Firebugs will be the basis for our teaching fleet. I.T. 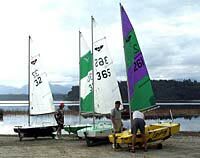 Lake Tarawera Sailing. I hope you can use these photos in some way to promote these great little craft. B.H. NSW. Hi Peter, Nick Palleson here I had such a great weekend at the FB champs, I came second out of the seniors. 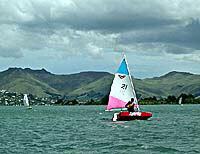 The first race I came first out of the fleet and the second race I came second also. Do you think you could zoom in on this picture of me in sparky and could you put it in the website gallery thanks reply bac asap thanks nick palleson. PPYC. If you would like to add some comment of your own to this page simply send them to FBHQ with a photo. "Ross and Jason on ‘White Dwarf’. Turn over party in instant shed.